Today in Masonic History Henry Irving is born in 1838. 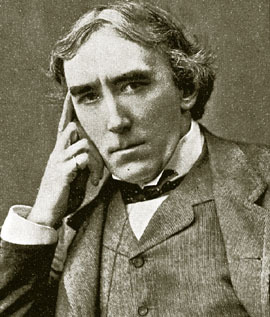 Henry Irving was an English stage actor in the Victorian era. Irving was born in Keinton Mandeville, Somerset, England on February 6th, 1838. He spent most of his youth with his aunt in Halsetown in Cornwall, England. He attended City Commercial School for two years. At the age of 13 he got a job in a law firm. At the age of 18 he saw Hamlet performed and he knew he wanted to be on the stage. After that he sought out lessons and then worked his way into theaters until his big moment came in 1871 in a play called The Bells. Irving's first appearance on the stage was in September of 1856 in the play Richelieu. He would spend much of the next ten years improving his craft and working with stock companies in England and Scotland. In 1869, Irving married Florence O'Callaghan. The couple had two children. In 1871 on their way to opening night of The Bells the couple got into an argument about Irving's career choice. Florence asked "Are you going on making a fool of yourself like this all your life?" With that, Irving got out of the carriage and disappeared into the night. He would never see her again. He even distanced himself from his two children, although as they grew older he became closer to them. Florence would never divorce Irving, the two would remain married until their deaths. In 1878, Irving began working with Ellen Terry. Terry would be Irving's leading lady for the next fifteen years. It has been speculated that Terry and Irving with lovers. Almost all of the correspondence between the two has been destroyed by family members. It is claimed that Terry was asked directly whether she and Irving were lovers by a family member. She replied "Of course I was. We were terribly in love for a while." There were few witnesses in the room and quite often she told different versions of their relationship. On October 13th, 1905, Irving was taking part in a performance in Bradford, West Yorkshire, England in the play Becket. He uttered the dying words of Becket "Into thy hands, Oh Lord, into thy hands." He then collapsed from a stroke. Within an hour he had passed away, having never uttered another word after the line he delivered on stage. Irving joined Jerusalem Lodge No. 197 in London, England in November of 1882. In 1887 he became a founder and first Treasurer of Savage Club Lodge No. 2190 which as associated with the Savage Club in London which is a gentleman's club.